There has always been a debate over what type of material makes the best omelet pan. Is it aluminum, Teflon, or ceramic? This review intends to answer that very question and more. It’s Teflon, if you were wondering. After all, the goal is to make the perfect omelet. Having the right equipment for the job can make all the difference in the world. Your pan should be durable, non-stick, and handles easily, allowing you to make the most delicious omelets every time. How to Make the Best Omelet? What exactly should you be looking for in an omelet pan, other than the size and the depth of the pan? Well, there are three main things that were focused on when reviewing all the omelet pans. First, the overall durability of the pan is important. Was it built with a strong material that is thick enough to stand the test of time? The thicker the material, the less likely it will warp, and the less likely the coating will peel off at high temperatures. If you happen to have a thinner pan, make sure that you monitor the temperature to avoid overheating and to prevent inflicting potential damage to the material of the pan. Also, wait until the pan has cooled down completely until you clean it, as putting it in cool water can cause the pan to warp. 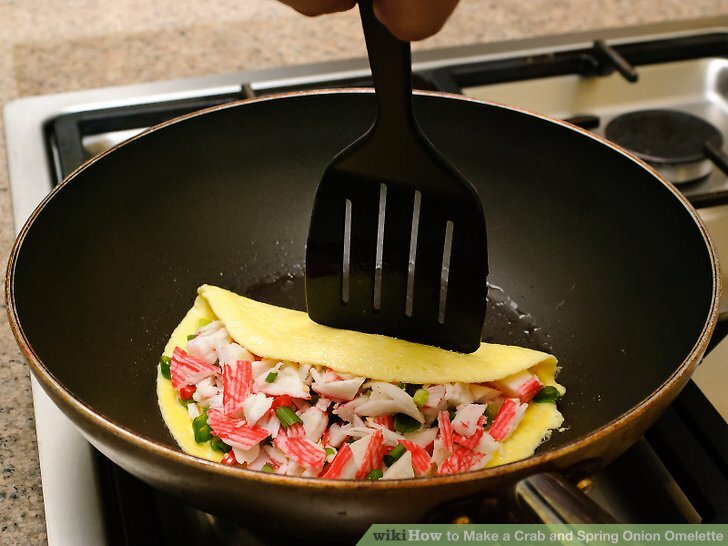 Second, a non-stick coating is important for making a delicate dish like an omelet. To keep a non-stick surface in the best condition, you must take care of your pan by using proper utensils and cleaning it right. To prevent scratches or scrapes from utensils, stay away from metal. Instead, use wood or plastic. Some omelet pans are easier to clean than others. A pan that is easy to clean and requires little cleaning or scrubbing will last longer than the ones you still need to stick in the dishwasher. This is because it protects the non-stick surface from damages. Finally, the ergonomics of the pan is also important. The overall weight, shape, and handles should be taken into consideration to see if the pan is easy to use. A good pan will have a good feel, a bit heavy, but easy to maneuver. It shouldn’t cause arm or wrist pain while using it. There are a few different shapes of pans on the market – from hinged, rounded, to squared – each with its own unique advantages and disadvantages. Finally, a solid handle should have a riveted angle in order to provide comfort while using it. Most importantly, the handle should stay cool to avoid accidents like getting your hands burned. To make the perfect omelet, there are other things you need to take into account than just buying the perfect omelet pan. Using the proper utensils can make all the difference in the world. For example, using the proper spatula for your pan will increase the longevity of your pan, decreasing scratches and overall wear and tear. I suggest using a silicone spatula, which tends to work better on delicate food. One other thing to consider is what you will use to mix the eggs. Decide whether a fork or a whisk will do the trick. They have different outcomes as a whisk will make your eggs lighter and fluffier. A whisk incorporates more air into the egg mixture as compared to just using a fork. Using a fork, on the other hand, will help your eggs cook more evenly as it reduces the amount of air incorporated in the egg mixture. For the best outcome, apply butter on the pan with the help of a brush. If you don’t have a brush, you can simply peel off a bit of the butter’s covering to expose some of the butter and then lightly run the butter on the surface of the semi-hot pan. This extra step adds more flavor to the omelet you are making. Make sure you are armed with the right kitchen utensils and tools, so you can make the best omelet. The most important thing to remember when making the best omelet is having the freshest ingredients. Using farm fresh eggs makes a difference when it comes to the quality of flavors. The proper tools and techniques also contribute to producing the perfect omelet. Soak the eggs before you start to cook them, it will allow them to cook faster and become more tender. Heat your pan up before you add butter, this will ensure that your omelet won't stick, no matter what type of pan you are using. When using the spatula to keep the eggs from sticking to the edges of the pan, rotate the pan while holding the spatula still. T-fal has a non-stick design that uses a metal material that is scratch-resistant and has durable properties. It is even safe to use metal utensils to cook food in this pan. This is great, especially when you have children, who want to help out but don’t understand all the kitchen rules. Plus, it has a “thermo-spot heat indicator,” which is a spot in the center of the pan that glows red when it is heated to the perfect cooking temperature. With a bit of care and attention you can cook up a delicious omelet. This pan is also dishwasher safe and it can go into the oven with temperatures of up to 400 degrees Fahrenheit, making it versatile and handy for many different meals. It has a depth of 1.75 inches, making it perfect to cook up a variety of meals. The handle has a comfortable grip. Flipping your omelet like a pro is easier. Unfortunately, this pan has a major flaw. Even though the pan has a stainless-steel induction base that heats the pan evenly, it can’t be used on any type of cooking surface. Your usage may only be restricted to induction type of cookers. After using this pan for a while, it may warp. This will cause the pan to have an uneven heat surface, which won’t provide even cooking results. Nordic Ware is a classic omelet pan that has a hinge-style design that allows you to cook the perfect omelet. No hassle or mess! With two handles, it makes it easy to flip. The two separate sides of the pan allow you to fry up eggs on one side and mushrooms or vegetables in the other. Create something new and delicious with ease. This high-quality pan is constructed with care. The hinges and the mechanisms close properly, which makes all the difference when making a delicate dish. 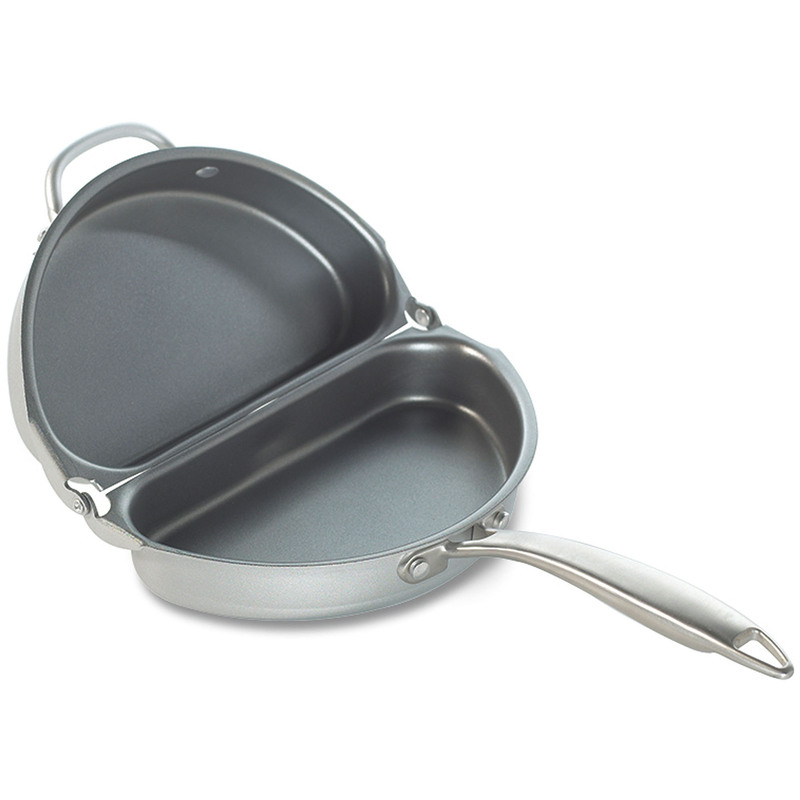 The aluminum construction will ensure your omelet is cooked evenly, with heat distributed over the area of the pan. The non-stick coating is great, as the egg slides out of the pan easily. Making this pan easy to clean as well. You can just pop it in the dishwasher and forget about it. There is one slight downside to this omelet maker. The small handle can get very hot. Be careful! Just be sure to have a towel or a pot holder nearby, just in case. Other than that, this is a great omelet pan for beginners and even to more advanced home cooks. Calphalon is the only non-stick omelet pan in this review that comes with a lid. This is a unique feature, as the glass lid allows more moisture to stay in your food. 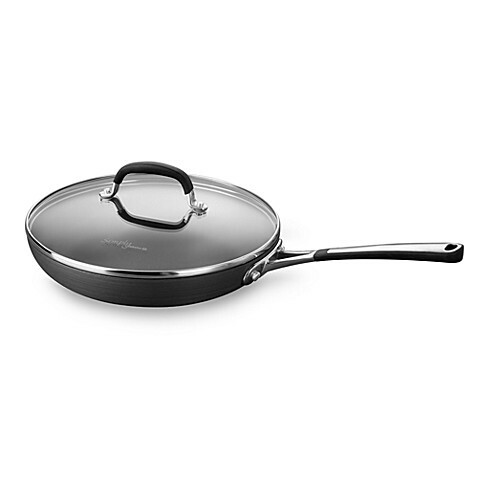 The anodized exterior on the pan will not crack or chip. It heats up fast as well. You can even throw this pan into the oven in a maximum temperature of 400 degrees Fahrenheit. The pan will distribute the heat evenly and cook up some great meals if you take care of it. To ensure that the pan will last, make sure that you only use wood or plastic utensils. Do not overheat it or use an oil or spray that will leave a residue build-up. By following these simple tricks this pan should last for many years. This pan works great, but over time will show some wear and tear. It is important to take care of this pan or else it may develop pitting on the non-stick surface. It could even develop a spot where the metal has been worn down. Even the bottom of the pan will start to wear down. The coating may come off and leave a residue on any surface it comes into contact with. Cuisinart uses an innovative design, which interlocks two skillets, so you can easily flip and cook your frittata or omelettes. This pan also allows you to cook up a variety of dishes, from crepes to stir-fry, giving this pan so much flexibility when it comes to cooking. The thing that makes this pan stand out from the rest is the overall weight. Its lightweight properties make this very easy to handle. Plus, the pan can cook a variety of dishes perfectly. This pan is built to last and easy to clean. 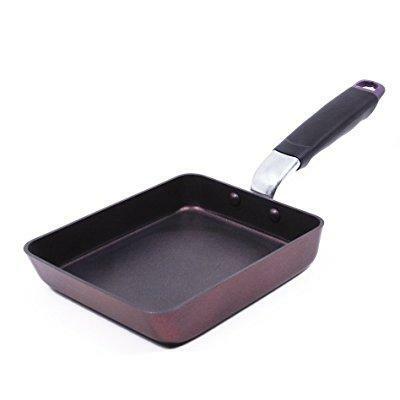 The non-stick surface, size, and depth make it ideal for cooking a wide range of dishes. It is safe to use on any cooking surface and even in the oven for a maximum temperature of 350 degrees Fahrenheit. The ergonomic handle does not get hot and they are built in such a way that you have a secure grip when cooking your food. Overall, this pan is great and there are no real flaws. However, it does take a little patience and practice to use it properly. When you want to flip the pan, you must make sure both sides are warmed up to the right temperature. Also, when you flip be careful that you don’t spill any oil or anything on the burner that may start a fire. 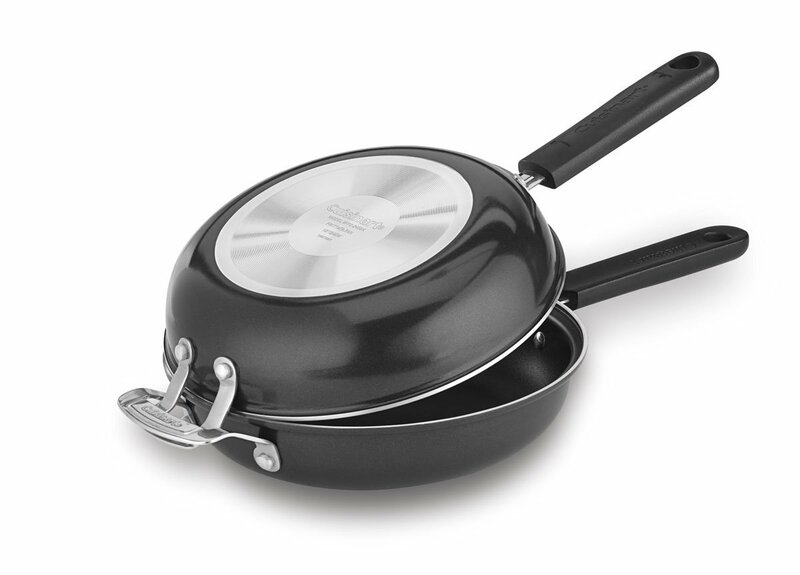 One of the striking features of the TeChef pan is its color. The “Aubergine Purple” represents splendor and glory. It reflects the culture of the Tamagoyaki Japanese cooking and lifestyle, which is quite interesting. This beautiful pan from TeChef will allow you to cook up healthy meals for the whole family. TeChef has a unique shape, which makes it easier to flip food like omelets, frittatas, or pancakes. 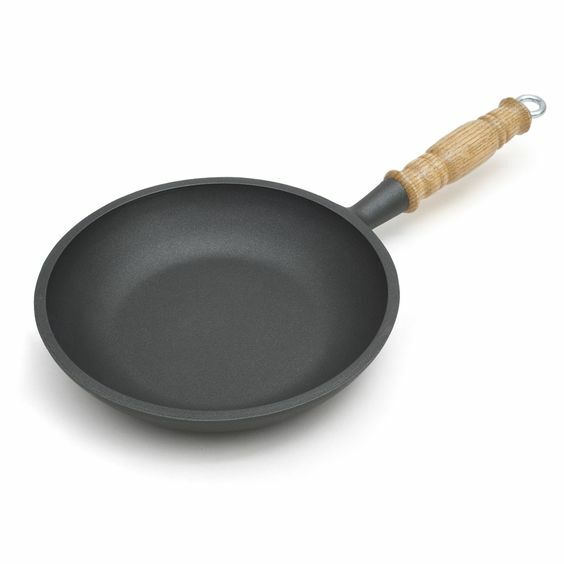 First, it is made with a DuPont Teflon coating to make it non-stick, without the use of PFOA. Second, the pan is constructed with the best materials, using aluminum and a stainless-steel﻿ bottom, with no lead or cadmium used. Third, this pan heats up fast and evenly, which can allow users to cook many different meals to perfection. There is little to complain about this product. This pan may take some time to get used to, with its unique square design. Some people might find the shape a downside, but others might find the unique shape ideal for them. Generally, it is easier than using a round pan. 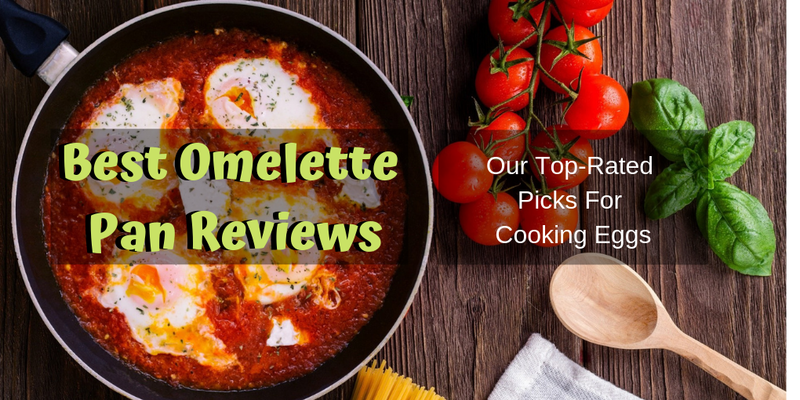 When deciding on the best omelette pan, consider buying something stylish like the Nordic Ware Italian Frittata and Omelette Pan. It has two handles making it easy to flip. The TeChef is one of your best options for making omelette because of the shape. It has all the properties you need to create delicious meals. You will also find this ideal for your budget because of its comparatively lower price. The Cuisinart non-stick pan set is perfect when making bigger batches of omelet and other meals. It’s easy to use, has a good temperature resistance and is also budget-friendly. Don’t like to do a lot of clean-up? Try the T-fal non-stick fry pan. It is dishwasher-safe and has good heat-distribution properties. You can even put it in the oven, so you don’t need to transfer what you are cooking to an oven-friendly pan. The price is also not bad if budget is an issue. If you like to multitask when preparing your breakfast or you don’t like cleaning multiple pans, the Nordicware Italian omelet pan is your best choice. You can cook different meals in one pan, reducing cooking time and clean-up time. The Calphalon non-stick pan is the most expensive option but for its quality construction and additional features like the glass lid, it’s worth the extra price. The stay-cool handles also make this a perfect addition to your kitchen. Need more help finding the right cookware for your home cooking needs? Our homepage has all the information you might need. Read product reviews, buying tips and product recommendations to know what your best options are out there.